Fig. 1: TRPL streak image of Ga(As)Sb QDs with no capping QW. Fig. 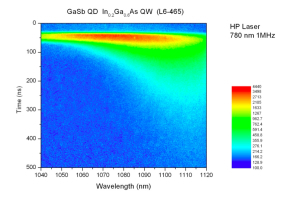 2: TRPL streak image of Ga(As)Sb QDs with an In0.2Ga0.8As capping quantum well. The mid- and far-infrared wavelength range is of great interest for a number of applications, including medical imaging, free space communications, and gas sensing. For example, many common pollutants have easily identifiable signature absorptions in the infrared, such as hydrocarbons (3.3 μm), HCl (3.55 μm), CO2 (4.25 μm), CO (4.73 μm), NO2 (3.45 μm), N2O (4.5 μm ), NO (5.24 μm) and SO2 (4.0 μm). These long wavelengths are inaccessible to conventional InAs/GaAs devices, and so alternative material systems must be employed. Antimonide-based compounds are a promising candidate for this. 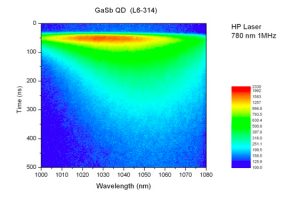 In CAPPA, time-resolved photoluminescence (TRPL) measurements were performed on molecular-beam epitaxy (MBE) grown GaAsSb/GaAs quantum dot structures: one with an InGaAs capping quantum well and one without. These structures exhibit a type II band alignment, meaning that the holes are confined in the dots, while the electrons are confined outside the dots, principally via Coulomb attractions. The addition of the QW in the first structure thus serves to increase the confinement of the electrons and facilitate greater electron-hole overlap and recombination rates. TRPL was used to determine the structures’ ground state transition energies and their dependence on the number of photo-generated carriers. The samples were excited using a PicoQuant pulsed laser diode emitting 780 nm, 60ps pulses with a repetition rate of 1MHz. Streak images were recorded with the Hamamatsu streak camera. In these type-II Ga(As)Sb QDs, the photoluminescence peak was seen to red-shift over time (Figs. 1 and 2). In combination with theoretical modelling, this was shown to be connected to Coulomb effects caused by the decreasing number of photo-generated carriers in the dots. The group also has a vacuum Fourier Transform Infrared (FTIR) spectrometer capable of measuring emissions in the far infrared and THz regions, in particular for observing intraband transitions at low temperature under electrical and optical pumping. This opens up fresh research avenues for the group, with the possibility of exploring and developing optical sensors for pharmaceutical applications, for example.